The University Faculty Senate provides a collective voice for the faculty of the University of Richmond and exercises those responsibilities assigned to it by the Board of Trustees and the university faculty as stated in the Faculty Senate Charter. The policy for University Faculty Committees and Appointment of Faculty to University Administrative Committees declares which University Faculty Committees shall exist, the membership and responsbility of those committees, and other matters related to their operation. 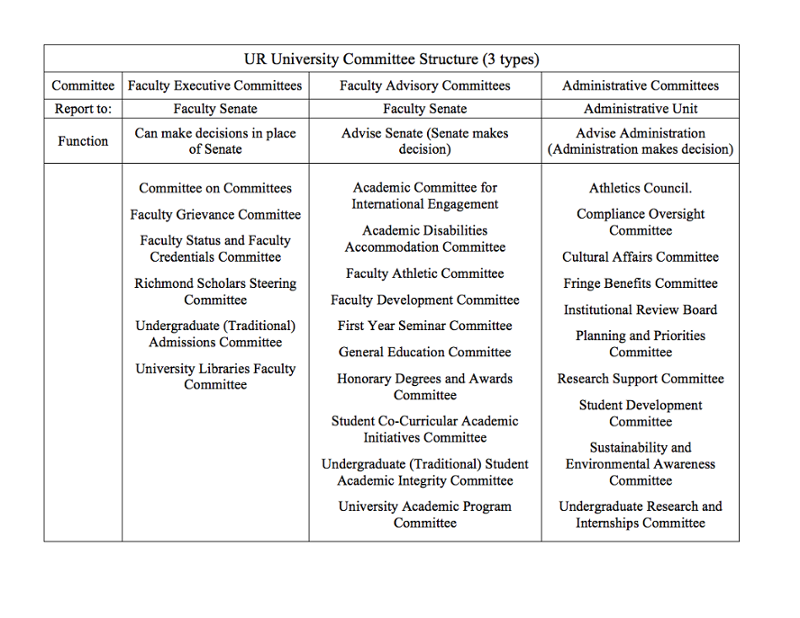 In Spring 2016, the University Faculty Senate approved its Committee Policy Document. The most recent version was approved in April 2018 can be found here: Committee Policy Document. The committees, membership, duties, and processes can be found in this document. The 2018-19 academic year committees and membership became effective on June 15. Those committees and members can be found here: University Faculty and Administrative Committees. If your committee wishes to submit a passed motion to the University Faculty Senate, please review these guidelines.